The Roads of National Significance are failing cost/benefit analysis and have had millions spent on consultants and planning with little tarmac laid. They are rapidly developing into roads to nowhere. The attempt to emulate Australia and to mine, drill, frack and dig our way to a fossil fuel fortune is stumbling as coal prices plummet and the mining industry in New Zealand is coming under intense scrutiny. The attempts to introduce widespread ideological change to an education system that was already performing better than most have been a debacle. The Government's refusal to follow good process and their lack of good faith when working with the education profession and school communities has been telling. The state asset sales are being met with strong resistance, the likelihood of a citizens initiated referenda (one of the easiest petitions to get signatures for) and is well behind schedule. The claimed mandate for this temporary influx of funds is looking decidedly shaky. The Christchurch recovery would be hard for any Government to oversee but the way schooling changes have been managed, how rent profiteering hasn't been managed, the housing decision delays and combined with Gerry Brownlee's insensitive remarks, I can see few voting for National from the Christchurch region in 2014. The gutting of the state sector to save money has seen system failures bubbling up everywhere, largely due to staffing shortages or poorly managed changes. ACC, WINZ, Inland Revenue, Housing New Zealand and the Ministry of Education have all struggled to provide reliable oversight of systems and communication. At the same time spending on consultants has skyrocketed. As manufacturers struggle and lay off staff, median wages and family incomes drop in value, Government borrowing steadily rises and the economy falters, it is more difficult to accept the recession and the earthquake as the primary causes. Our high dollar is hurting our economy and the Laissez Faire economic approach is not delivering. 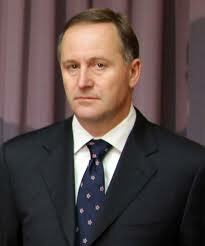 John Key is becoming less of a "good bloke" Prime Minister and more of a "good grief, did he really say that?" train wreck. His honesty, integrity and diplomacy is falling short on a daily basis. Creating jobs has been problematic when the Government has slashed 3-4,000 jobs from the public sector, overseen the loss of 40,000 manufacturing jobs and tens of thousands have shifted to Australia. Two National Ministers have behaved with some integrity when things that they were responsible for turned pear shaped, Nick Smith and Kate Wilkinson both resigned from Ministerial responsibilities in a manner that one would expect from honorable people in such positions. They are unique in this Government because the standard responses from their colleagues in similar situations have been denial, memory loss, shifting blame and personal abuse. Now that it is unlikely that National will head into the next election with a positive record of constructive change and a booming economy the only thing they can do is discredit the opposition. Since Russel Norman has often been referred to as the real leader of the opposition and the Greens have been particularly effective as an opposition party there have been a growing number of attacks from both National MPs and their supporters. Few attempts are made to address the actual arguments and there is general use of cliched comments and personal abuse. The Greens are watermelons - this refers to the perception that the Greens should just be an environmental party and shouldn't involve themselves with social issues. Trying to address child poverty and dropping family incomes has been slammed by some National MPs who think the Greens should be a parliamentary fringe group that just fights water issues and the plight of endangered snails. The Greens will just print and spend copious amounts of money - This is in reference to the Quantitative Easing suggestion from Russel Norman and the attempts to raise the minimum wage and lift 25% of our children out of poverty. It ignores the fact that the Greens were the only party in the last election that fully costed their policies and that their home insulation scheme was one of the few initiatives introduced by this Government that produced a positive return. It also ignores the $12 billion this Government is spending on roads that are largely unnecessary and cutting $2 billion from government revenue each year through the tax cuts for the wealthy. Russel Norman has red hair, is an Australian and was a socialist - As Russel continues to impress with his grasp of economic issues and his upfront management of crisis, personal attacks become rife. Apart from his hair colour the supposed damning description would also describe one of New Zealand's greatest Prime Ministers, Michael Savage. The Greens tell lies - This is a really desperate charge and quite ludicrous when Green MPs are regularly rated as the most trustworthy in parliament and the lies are always implied and never substantiated. The Greens are "Wacky" and "Fruit Loops" - The Prime Minister and his mate John Banks use all manner of colourful insults when logical arguments are lacking. It used to be a reference to marijuana that was most used as a put down when at the losing end of a debate, however with ex leader Don Brash and the Law Commission supporting the Greens drug policies, this isn't so effective anymore. So wacky and fruit loops is the best they can think of. Fabricated Green scandals - Cameron Slater and Keeping Stock regularly attempt to prove subterfuge and dodgy dealings by the Greens. The claim that the Greens are paying for petition signatures is one of the most ludicrous that they have come up with. Some, like the claim that the Greens are dishonestly using child poverty to raise party funds, make mainstream media even though the request was quite transparent. This is desperate stuff. I predict next year will see a ramping up of these attacks on the Green's credibility and as the attacks become more frequent and frantic I will remember Gandhi, "First they ignore you, then they ridicule you, then they fight you, then you win", roll on 2014! Thanks Robert and Shane, it is interesting that I got a negative endorsement for this post and yet no attempt to rebut my points through a comment. It will be interesting to see if any will try and defend either National's record or their strategy to discredit the Greens. Although I could never vote green as it stands, I would still rather have you lot than these Nats, just as I would Labour (as they were inder Komrade Klark). I am not sure you have the definition of watermelon quite sorted, though. My understanding of the term watermelon when in reference to the Greens is that we appear Green on the outside but are really "nasty" red socialists on the inside. What's your interpretation Shane? I like the fact that the red target is obvious. I don't like it when I cannot see the target.